Yesterday I popped down to the Indieplus Cinema near Sinsa Station to see the morning screening of Park Chan-kyong's "Manshin: Ten Thousand Spirits" (만신) and I was blown away. It's a beautiful, tragic, uplifting, mysterious cross between a documentary and a biopic. 7. "Captain America: The Winter Soldier" isn't out till next Wednesday. What better way to prepare yourself for the next story in Marvel's odyssey than by diving into the mystical world of superstition and shamanism. You won't need your brain when you see good old Cap' next week, so you might as well use it now. 6. Every year we're lucky to get a small number of Korean films shown on the big screen in Seoul with English subtitles, but those screenings are few and far between. Movies are meant to be watched in the cinema, not on your tv or smart phone, so make the effort. Plus you can't find Park's previous award winning film on DVD anywhere (or at least I can't seem to get a hold of the fabulous Anyang, Paradise City). Documentaries are not usually great money makers and there's a chance that once this subtitled run ends it may be hard to catch a glimpse of this flick again. Also, Indieplus is a fantastic tiny venue that needs your support. The tickets are cheap, the screening room is cosy and the projection quality is fabulous. 5. Ever worry that documentaries might be a little dry? A little too intellectual? Fear not, Park's style takes the viewer on a narrative journey that feels close to watching a drama. Talking heads do appear, but much of the time is spent in the world of the shaman, with plenty of well acted reconstructions. 4. Which brings us to the performers. Moon So-ri (A Good Lawyer's Wife, Forever The Moment, Oasis, Peppermint Candy) is on top form, Kim Sae-ron (the kid from The Man From Nowhere) proves her serious drama skills and Ryu Hyeon-kyoung (Petty Romance, Cyrano Agency) shows that she can do more than just light comedy. All three performers are outstandingly good at recreating one woman's journey through the twentieth century to become one of Korea's greatest shamans. 3. Park Chan-kyong is one of the best documentary makers and visual artists in Korea. Did you see "Bitter, Sweet, Seoul"? That incredible hourlong tribute to the capital of Korea made up of videos sent in by residents and visitors. That was all down to Park Chan-kyong and his brother Park Chan-wook. It's a beautiful tribute to this bustling metropolis and it doesn't shy away from the more uncomfortable elements of our city. If you haven't seen it then go watch it now and then go watch "Manshin: Ten Thousand Spirits". 2. Haven't you seen it already? No? If you have any interest in Korean history or culture, then "Manshin: Ten Thousand Spirits" offers you a window into a part of Korea that doesn't get talked about enough. Until the 1970's shamanism was a big part of everyday life, there were gods and spirits everywhere, and the role of the shaman was one of the most important in the village. This film gives you a condensed history of shamanism in the twentieth century, its almost complete disappearance thanks to the sweeping modernisations of Korea forty years ago, and its rebirth. There's plenty of archival and new footage giving you a glimpse of ceremonies from the recent past, and the reconstructed dramatic scenes also offer insight into what shamanism in Korea used to be. 1. 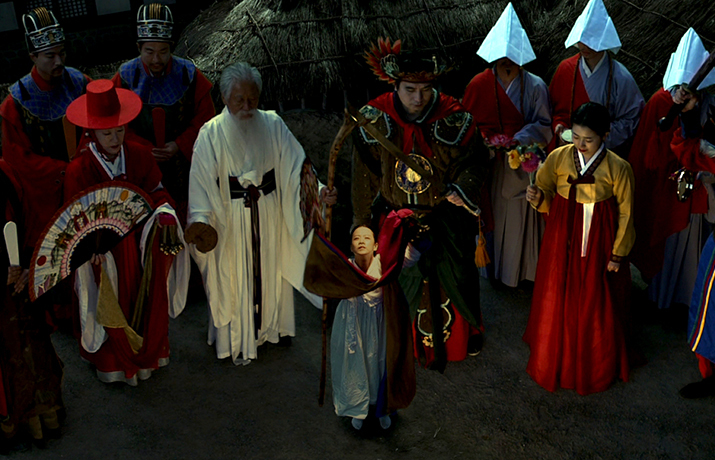 Kim Geum-hwa - Important Intangible Cultural Property #82, she is the "National Shaman" and this is her film. Based on her autobiography "Silk Flower Nomsae", it tells her story from her perspective and allows us to understand what made her become a shaman, and what impact it has had on her life. She opens the film with a prayer to the gods of cinema and filmmaking, asking them to bless the production, bless everyone involved and bless those in the cinema watching. She invites us into her life and bears her beautiful soul. We are allowed glimpses into traditional rituals and performances that show off her extraordinary talents and put some of the stuffy, staged shaman related performances you might see at the National Gugak Center to shame. Through her words, her experiences and her rituals we become connected to Korea, to the land and to the spirits around us. No matter what your belief, this film will leave you astonished, amazed and impressed with the life of Kim Geum-hwa and all that she has done. Convinced? I hope so. I urge, implore and beg you to take advantage of these screenings while they last and to go see what may be one of the best films of 2014. The Seven Stars will be waiting for you. Thank you, Paul, for the recommendation. This sounds like my plan for this weekend. Please keep your blogging work up!